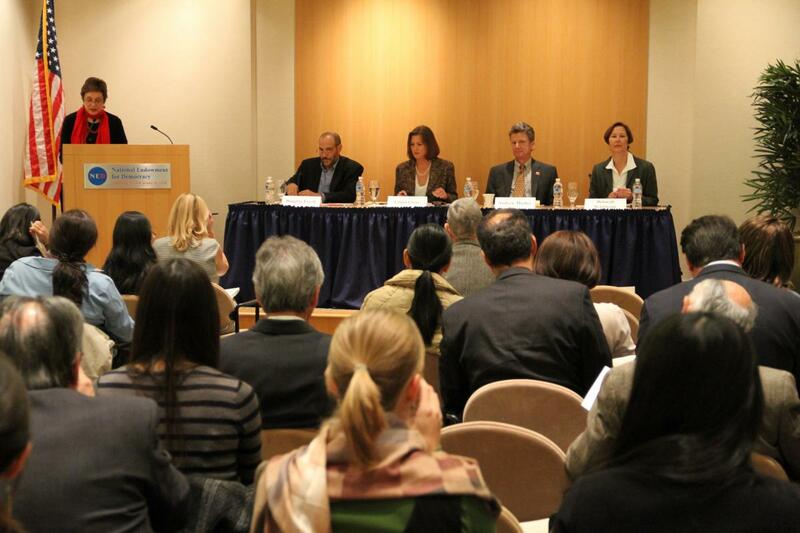 On November 2, CIMA hosted a panel discussion on its recent report, Winds From the East: How the People’s Republic of China Seeks to Influence the Media in Africa, Latin America, and Southeast Asia. The event featured the report’s authors, Douglas Farah and Andrew Mosher, as well as American University’s Deborah Bräutigam, who served as a responder. NED’s Louisa Coan Greve moderated the event. As Western news outlets have cut their overseas staffs and U.S. and European governments are providing fewer resources for international training and support, China has made media aid a high priority in Africa and Latin America, in particular. Through cultural programs, broadcast news, and aid to the media sector in these regions, China is attempting to create a positive image for itself, and portray the country as a reliable friend and partner. During the discussion, the authors outlined China’s new global initiatives in media development, arguing that such activities shift the media’s role away from a watchdog stance toward the government to one where the government’s interests are the dominant concern in deciding what stories are covered. While noting that it is too early to determine the broad effects of such efforts, Farah and Mosher called on media development implementers and those who fund them to take note, as China’s activities also often result in helping authoritarian governments expand control over their local media, while working to undermine the democratic model of a free and independent media. Farah pointed to hard-won press freedoms in Latin America as an example. In her critique, Bräutigam argued that while there is little direct evidence that the Chinese government aims to reshape much of the world’s media in its own image, its efforts have built up the country’s position in the mainstream media among competitors (such as CNN International, Sky News, and Al Jazeera), created business opportunities for Chinese companies, and influenced local public opinion. The audience engaged in an active question-and-answer session, raising more questions than answers: will Chinese initiatives in media development change how information is spread in these regions in the future? Is there evidence now of such activities in reporting where China is active in Africa and Latin America? Are the country’s efforts simply demand-driven, as one of the panelists suggested, or do they point to a larger strategy to reshape both public opinion and local media models? The authors responded that the purpose of the report is to provide a foundation to launch more systematic investigations into the topic and challenged audience members to continue their own preliminary research. Douglas Farah is the president of IBI Consultants and a Senior Fellow at the International Assessment and Strategy Center. He is a national security consultant and analyst. Previously, he served as a foreign correspondent and investigative reporter for the Washington Post for two decades, covering Latin America and West Africa. He has also written for the Boston Globe and US News & World Report, among other publications. Farah was awarded the Sigma Delta Chi Distinguished Service Award for Foreign Correspondence in 1988 for a Washington Post series on right-wing death squads in El Salvador. He also received Columbia University’s Maria Moors Cabot Prize in 1995 for outstanding coverage of Latin America. Farah is the author of Blood from Stones: The Secret Financial Network of Terror (2004) and Merchant of Death: Money, Guns, Planes and the Man Who Makes War Possible (2007). He holds bachelor’s degrees in Latin American Studies and in Journalism from the University of Kansas. Andy Mosher is a law school student at Georgetown University and a media consultant, who has worked closely with CIMA and the International Research & Exchanges Board. He is the author of a CIMA report, Good but How Good? Monitoring and Evaluation of Media Assistance Projects. He spent 28 years in the newspaper business, most recently with the Washington Post, where, between 1990 and 2008, he was deputy foreign editor, foreign copy chief, and national business editor. In 2000, Mosher trained journalists in Zambia as a Knight International Journalism Fellow. A native of California, he attended the University of San Francisco. Deborah Bräutigam is a professor in the International Development Program at American University’s School of International Service, where her research focuses on China-Africa relations, foreign aid, industrialization, state-building, and development. A long-time observer of Asia and Africa, she has lived in China, West Africa, and Southern Africa, and traveled extensively across both regions as a Fulbright researcher and consultant for the World Bank, the UN, and other development agencies. Bräutigam is the author of The Dragon’s Gift: The Real Story of China in Africa (Oxford University Press, 2009), as well as publications on foreign aid and governance; taxation and state-building; and comparative development in Africa and Asia. Her blog, chinaafricarealstory.com, delves into the myths and realities of China’s African engagement.